What are good on ground options for curl enhancement and definition? I hear this question a lot and just today realized I had not blogged about any of these options. Although most of my products used for curl enhancement are from on line sources there are some on ground options that I've tried. Honestly the main thing that keeps me from staying with on ground products is usually the smell. I like more natural smells or smells that are sweet and woodsy--I tend not to like smells that are to me more chemically or strong. Plus I have a few allergies and usually if my nose isn't fond my hair and scalp won't be either. In any case I have several online options that I absolutely love (Curl Junkie CCCC Lite, Amourai Organique Duchess of Curls, Spiral Solutions Curl Enhancing Jelly (HG! ), Darcy's Botanicals Natural Coils Curling Jelly, and Donna Mira Mira Curl Curling Jelly. They tend to push aside the onground ones that I'm not as fond of--although they worked fine. Just to give a perspective. 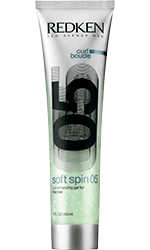 Redken Soft Spin 05: If you were lucky enough to score the full size bottle from Redken from the ad on naturallycurly.com you'll likely have tried this recently. I tried it--but it left my canopy straight. I may have used too much so I'll give it a go again. It has a strong smell (like most other on ground enhancers *sigh*) and several wavies are giving it the thumbs up. Generally I like Redken products--I did hair modeling for Redken as a way to pay for some of my college so I'm pretty familiar with their line (or I was, I'm old now lol!). I may try it mixed with something else and will udpate if I do. It's very sticky--like a gel--but the hold would be light at best. It did give me nice curls underneath but I just don't like that producty feel. Paul Mitchell Round Trip: This one does have a PEG modified cone in it (PEG 12 Dimethicone). It does give pretty nice enhancement. You can get it at BSS and Ulta and it may be available in some larger drug stores. It worked o.k. in my hair and the reason I swapped it was due to smell. ISO Bouncy Creme: IIRC no cone in this one. Worked fine. Left my canopy fairly straight (that's not uncommon as it is normally pretty straight) but my Goddaughter loves it and her hair is gorgeous. Usually a BSS or Ulta purchase and it's not expensive. $8-10 or so usually for a nice sized bottle. Worth a try. Another smell issue for me. Mop C Curl Defining Creme: I actually really like this one a lot. It is like minty Elmer's Glue but works great. It can build up so I wouldn't recommend a daily use but for one to two times a week it's a great product. You don't need too much--it can get producty if you do that. Expensive and available at many BSS. Ulta was having a clearance so I'm not sure they are carrying it anymore. Alagio Curl Balm: Weird strange color. Worked decently. Smell wasn't too bad. Just not my favorite. Inexpensive. Available at Ulta but it's usually by the regular condish's and not in salon products so ask a salesperson to help if you can't find it. BLOG GIVEAWAY! COME ONE AND ALL!